Spend the day getting to know the enchanting villages of Cinque Terre on a small-group tour. 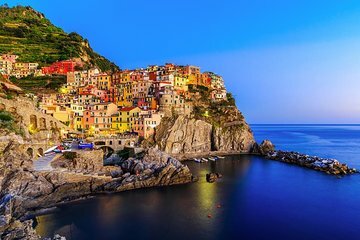 After being picked up from your hotel, explore the village of Manarola. Then, take a boat to Vernazza and explore the winding alleyways and colorful houses. Next visit Corniglia with some free time to explore and enjoy the views and natural beauty of the seaside. Finish the tour with a stop in Pisa for photo opportunities with the famous leaning tower. We had a wonderful tour for the 3 of us. Andrea was a fantastic driver and tour guy. He was very knowledgeable, personable, and patient. He picked us up at 7:30 am from Florence to start our tour of Cinque Terre. He took the time to take us through Manarola, then accompanied us on a train to Riomaggiore, and allow us to spend time on the beach before then taking a boat to Vernazza. Having Andrea as a personal guide for our family was fantastic. He even anticipated needing a reservation for lunch, and booked lunch at Gianni Franzi--with a table right near the beach. He gave us a walking tour through these 3 towns, then helped us with the train back to Manarola. We were allowed to take our time, despite running behind schedule for our final drive to see Pisa before returning to Florence at 9:30 pm. He was extremely patient, and knowledgeable about these sites, history, economics, etc.